I am so pleased to hand over the mic to Katie Workman today. 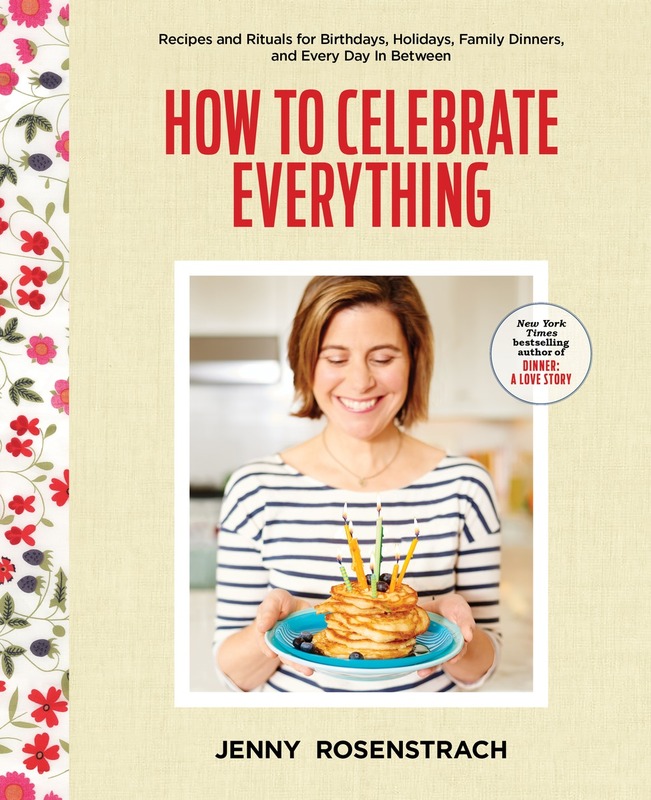 You might say the two of us are sisters in dinner — we met in 2013 at The Family Dinner Conference (yes, it exists), she’s blogged for years, and has two books out on the subject, the latest of which might be my favorite. It’s called Dinner: Solved and it’s nothing if not strategic, showing you how to make small tweaks as you cook (swap in chili powder for the maple syrup for the spicy option, omit this step if you are feeding a vegetarian, etc.) in order to accommodate everyone at the table. “Accommodate” might be the wrong word. Maybe “enthrall” would be more accurate given some of the recipes: Salmon Burgers with Avocado Wasabi Crema, One-Sheet Middle Eastern Dinner, Lemon-Horseradish Potato Salad, you get the idea. 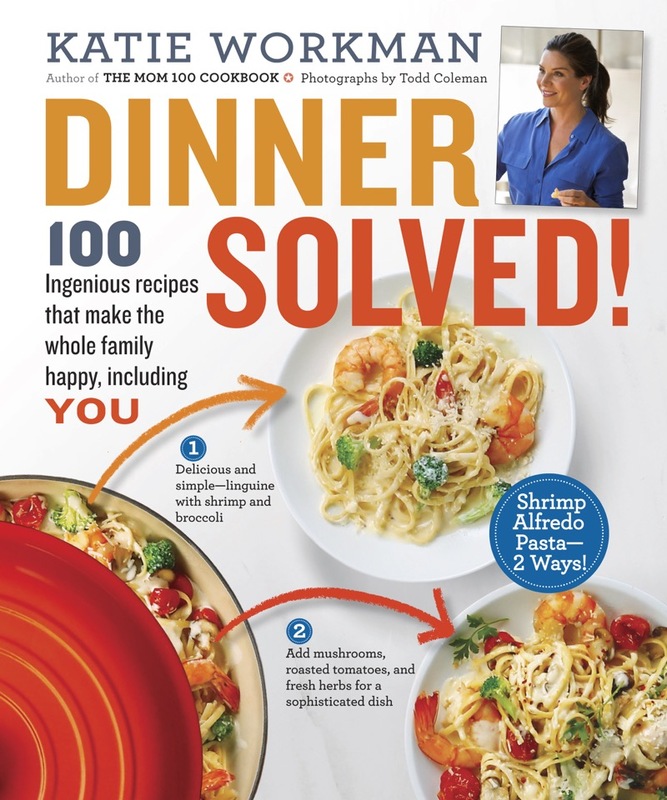 In honor of the book’s publication and just in time for back-to-school, Katie was nice enough to give us a few weeknight dinner tips, as well as her recipe for skillet lasagna, that I for one will be making this weekend. Thanks Katie! Many people approach the start of school, and the accompanying slightly-relentless-back-to-school dinner schedule that accompanies this time of year, with apprehension. This apprehension may range from a “Gee, I really need to shake up my Wednesday is Chicken Paprikash night” level of concern to a “Golly, I’d rather regrout a prison bathroom than think about making dinner” level of anxiety. I’m not here to judge the appropriate level of apprehension. I enjoy being judged about the same amount as the next person, and I’m quite sure that the organization of my linen closet isn’t going to win any housekeeping awards. 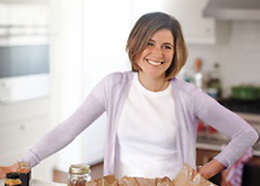 But like my friend Jenny, I know a little bit about weeknight dinners, and I’m happy to share. 1) Sometimes dinner doesn’t have to be Dinner. Sometimes it can just be leftovers, maybe slightly disguised as quesadillas, or tossed with some hot rice or pasta. Sometimes you can make a bunch of baked potatoes, and put out everything you think could possibly be an option for a topping, from leftover chili to shredded leftover roasted chicken and let everyone assemble their own potato magnus opus. A big pot of rice works the same way. 2) Also, if dinner just isn’t going to happen, don’t stress – find time for a family breakfast, or a late night around-the-table snack. 3) Come to the table with an upbeat or funny story. It might be a funny story about your day. It might be a story about your kid’s birth or something adorable they did when they were little (because seriously, most kids and parents can get into that no matter how many times you’ve heard it before). It might be a story about the time you got into trouble as a kid because you sat on your aunt’s dog, it might be a story about something nice that someone did for you at work. A good story sets a good mood, and hopefully the rest of the table will chime in with something positive. 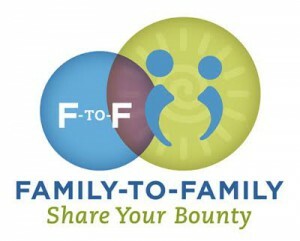 4) Pay it forward on Sunday and Prep Your Week. I am a broken record about this, but with good reason. If you take 30 minutes on the weekend and chop some onions, mince some garlic, juice some lemons, pluck and rinse some parsley leaves, throw some peeled ginger into the food processor, and put this all into little containers in my fridge it’s like a little (big) gift to yourself all week long. Then when you roll in without a firm dinner plan in sight you are much more likely to get it together quickly and calmly than if you have to start mincing garlic cloves at 6:30 (which, if you’re like me, can stand between you and dinner). 5) Make a big batch of easy taco mix and keep it in the pantry. Pick up tortilla shells and ground turkey on the way home. You will have tacos in 15 minutes. Keep shredded cheese on hand – always smart. 6) And (Mother, if you’re reading this, I’m sorry), even though it looks nicer, don’t take the time to put the condiments in little bowls. Just put the containers on the table. You all know what a ketchup bottle looks like. 7) Have you tried some of the new frozen pizzas? With the self-rising crusts? They are quite good. Heat the olive oil in a 12-inch (or larger) deep-sided skillet with a lid over medium-high heat. Add the onions and garlic and sauté until tender, about 5 minutes. Stir in the oregano, basil, and salt and pepper. Add the tomatoes, bring to a simmer, and let simmer for 10 minutes. Stir in the zucchini and spinach. Cook until the vegetables are limp and well blended, 5 to 8 minutes. Now the shortcut part begins: Break the noodles into halves or thirds—shards will fly, but you’ll use them, too. Shove the pieces of noodle, including the shards, into the sauce mixture, submerging everything as best and as evenly as possible. It will feel like it’s not happening all that well, but it will absolutely all work out. Reduce the heat to medium, cover, and allow it all to simmer until the noodles start to soften, 10 minutes. Lift the lid and give the mixture a few pokes and stirs partway through to redistribute the noodles. When the noodles have softened somewhat, stir in half of the mozzarella and all of the ricotta, using a spoon to fold and tuck in the cheeses between all the noodles, getting it toward the bottom of the mixture, swirling it around but not blending it completely at all. This is an imprecise science; that’s what’s so nice about the recipe. Sprinkle over the rest of the mozzarella, and the Parmesan if desired, cover the pan again, and simmer until the noodles are tender and the whole thing looks like lasagna, another 10 minutes or so. Let it sit, uncovered, to firm up for about 10 minutes before serving. Sprinkle over the fresh basil, if desired. Photo credit: Todd Coleman/Dinner Solved! Recipe by Katie Workman/Dinner Solved! © Workman Publishing. Smiling about #1 because my answer to “what’s for dinner” is often “leftovers in a tortilla.” My family is perfectly happy with that. wait – another Mom out there put all the condiments in little bowls too?! It was scandalous and shocking when I plopped the ketchup and butter container on the table! Wow, this skillet lasagna looks so good! I can’t wait to make it. And I feel like I just met with a Dinner Coach before the big game reading this post. Thank you! Living on my own often entails late night meals simply because of a) the time I get home from work, and b) repurposing whatever is in the fridge. I always ensure to have an extra portion for whatever I cooked for myself in the fridge or freezer so I can eat it reheated as is or find a new use for it. Also, not every meal during the week has to be different. I remember living at home where you know what the weekly suppers were going to be on Monday because a big (and I do mean BIG) casserole was made for a family of 4. A lasagna during the week, a beef roast, Mom’s breaded ketchup pork chops… I mean, I like variety, but there is also something very calming about knowing that the week is taken care of. I love #6 – Mothers gotta love them – they sometimes impart wacky things on us. 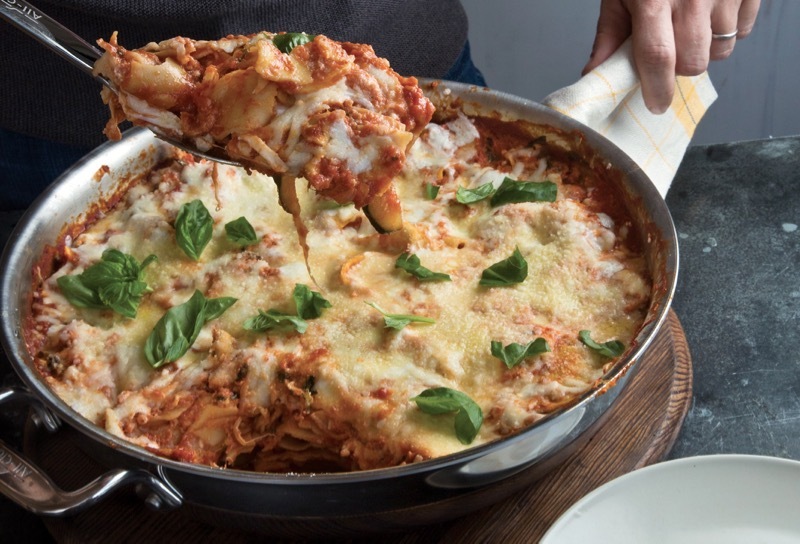 #dinnersolved skillet lasagna, #ftw ! This made my night and inspired my first week of school meal plan-thanks! Such a great post, I loved the lasagna recipe. Will definitely make it for when my parents come to visit next week. They still can’t believe that I started to cook (just a few months back) and want me to make something every time they come to our house. Oh, I so agree with advice #4. The feeling of giving your future-self a little help beforehand is always so pleasant. I do this with onions because I hate mincing them. I just fill a small container with sliced onions to last me a week. This lasagna looks soo good. Yum!